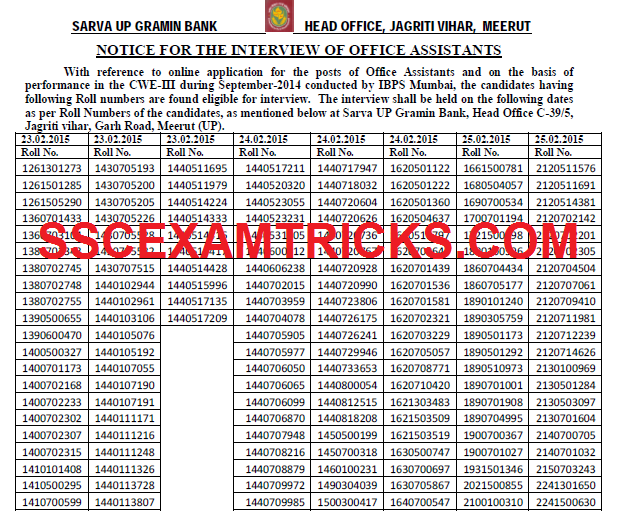 Sarva UP Gramin Bank (UPGB) has released interview schedule along with list of short listed candidates for interview which is schedule 23rd February to 25th February 2015 for 417 posts of Officers Scale I, II & III and Office Assistant (Multipurpose). The UPGB has released category wise / post wise cut off marks required for interview of the candidates. A Roll Number list of selected candidates is released who are called to attend personal interview for the posts of Officer Scale I, II & III in General Banking, IT, CA, Treasury Officer, Agricultural Officer and Office Assistants (Multipurpose) in the various departments. The interview letters has been sent by post/ courier to these short listed candidates. Earlier UPGB had released notification advertised for recruitment of 417 vacant posts of Officer Scale I, II & III and Office Assistant (Multipurpose) from 30th December 2014 to 14th January 2015 through ONLINE application mode. The selection will be done on the merit list prepared by calculating performance in IBPS RRB CWE III Exam which was held in the month of September / October 2014 and personal interview of the candidates. A huge numbers of candidates had applied for these posts. The latest news is that those candidates who had applied for these posts and waiting for their result / cut off marks / interview schedule, they can download their result/ cut off marks / interview schedule from the direct link provided in the end of the posts. The personal interview will be done along document verification of these short listed candidates. A list of documents which is required to produce at the time of interview is mentioned in the end of the posts. Those candidates who had applied for these posts can download the cut off marks required to qualify for personal interview from the direct link provided in the end of the posts. It is mandatory to bring interview letter to attend personal interview round by the candidate. No candidate will be entertained without admit cards and essential original documents mentioned to check / match the originality of the candidates. Sarva UPGB has released the cut off marks required to qualify to attend personal interview of the candidates. The Cut off marks has been released category wise i.e. General, Other Backward Classes (OBC), Schedule caste (SC), Schedule Tribe (ST) and others for Scale Officer II (General Banking Officers, IT & Marketing Manager). Those candidates who had scored above these mentioned cut off marks released will be short listed for personal interview. 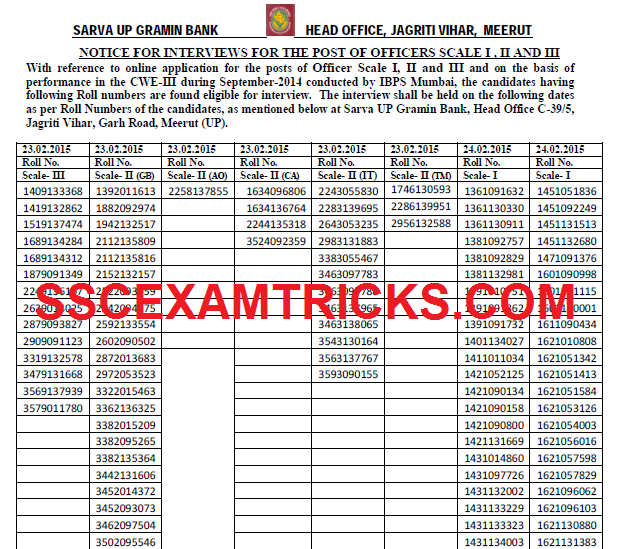 A list of short listed candidates has been released on the official website of Sarva UPGB. The interview letter to the short listed candidates will be released very shortly along with interview schedule. The interview will be conducted in MEERUT for all the posts. The interview has been scheduled from 23rd February 2015 to 25th February 2015. The short listed candidates are required to be come with the following documents to attend the interview schedule. The interview will be conducted along with document verification of the individual candidate to check / match the originality of the candidate. Three times more than required candidates are called for personal interview. Based on their Total Weighted Standard Scores (TWSS) the interview call letter has been sent and remaining applicants, if any would not receive an interview call from the Bank. All eligible candidates will be issued call letters at the correspondence address given by the candidates in their application form, which will be sent by post/ courier. The total marks for Interview will be 30. The qualifying marks i.e. bench marks in Interview shall be 40% i.e. 12 out of 30. It is mandatory for the candidate to bring their Interview call Letter by affixing his/her photograph on the call letter. Candidate has to bring this call letter along with original fee payment receipt and requisite enclosures while attending the Interview. No candidate is allowed to attend personal interview without having interview letter. So don’t forget to bring Interview call letter to the venue of interview. The list of documents is provided which is required to attend the personal interview of the candidate. No candidate will be entertained for interview without having these following documents. · Original fee payment receipt (Fee Challan). · Printout of the online application submitted. 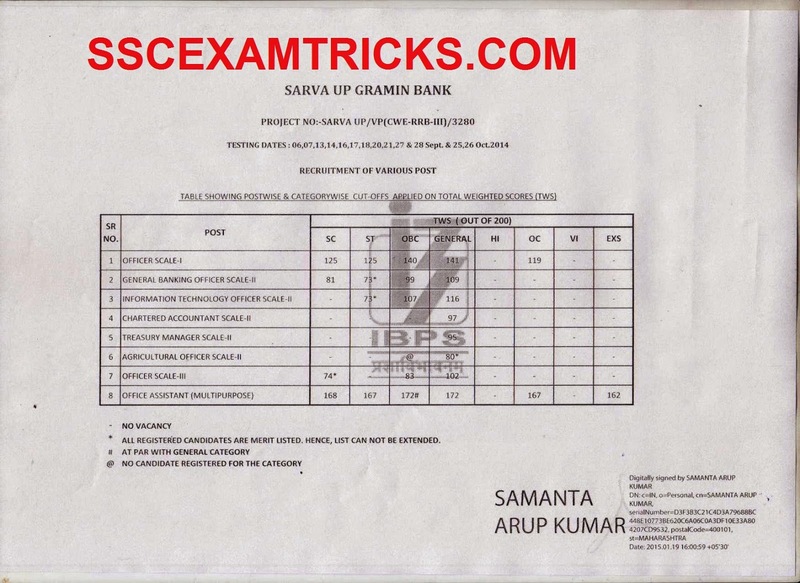 · Printout of IBPS Scores for the stipulated examination. · 10th standard examination Mark sheet in support of local language i.e. Hindi. · Attested copy of School/Board certificate/Birth certificate issued by Municipal authority as proof of age. · Caste / PWD any other related certificate as applicable. · Personal Bio-Data Form (To be downloaded from Bank’s website).